The college offers Diploma in General Nursing and Midwifery programme (3years) which has been approved by the Indian Nursing Council New Delhi and Uttar Pradesh State Medical Faculty, Lucknow. Apart from theoretical lectures at college, students are also exposed to clinical training at the university parent hospital and other affiliated multi-specialty hospitals. On successful completion of the course, there is ample employment opportunities exist for the nurses both in public and private sectors, in India and abroad. 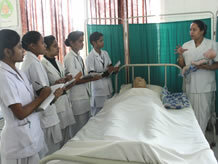 Students can also opt for higher studies in nursing.